Why build a Clone 4D Kit? What skill level is needed to build the kit? The builder will need to have a good level of metalworking/fabrication skills and have access to a lathe, milling machine, pillar drill, metal cutting saw etc. as well as other standard metalworking tools such as metric drill bits, end mills, taps, dies, and reamers. A ‘ tools required for construction ‘ list is included in the build manual. What else will I need to buy to complete the kit? To give the builder the option to customise the length of the Clone 4D, the bearing rails are not included in the kit. A full list of specifications and quantities are shown in the build manual. Stock aluminium, various sizes (where specified imperial equivalents can be used). An ‘ additional materials required ‘ list is included in the build manual. Depending on where the parts are purchased from the estimated additional cost to complete the Clone 4D kit is approximately £800. No welding is required, and a comprehensive 269 page build manual with detailed drawings and step-by-step instructions is included. You will also have access to 2 hours of HD videos showing every step of the build process. Which models can be built using the kit? Either the standard Clone 4D (carving area of 350mm x 800mm x 150mm), or the Clone 4D Extra (carving area 400mm x 1000mm x 150mm) can be built using the kit. So you can see exactly what is involved in building a Clone 4D Kit you can purchase the Clone 4D Kit build manual. Plus you also get access to the Clone 4D Kit building videos. If you then decided to buy a kit, the cost of the build manual is refunded. Download the Clone 4D Kit PDF Build Manual. Watch 2 hours of HD videos showing every step of the build when you buy the build manual download. 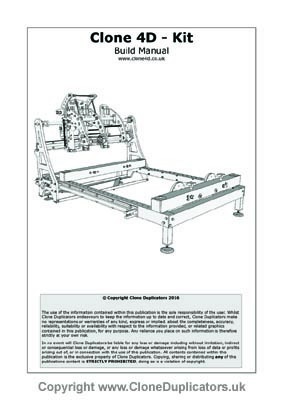 The kit building videos will provide a valuable source of reference material when building a Clone 4D Kit as they have been filmed in the same sequence as the steps shown in the build manual. To download a copy of the Clone 4D Kit Build Manual and watch the Kit Building Videos just click the “Buy Now” button above. After Paypal checkout has been completed a secure link will be sent to your inbox containing your login details. Once logged in to the kit building area, you will be able to download the PDF build manual and watch all the kit building videos. You can login anytime within the next 6 months using the login link at the top of the page or by following the link in the confirmation email. 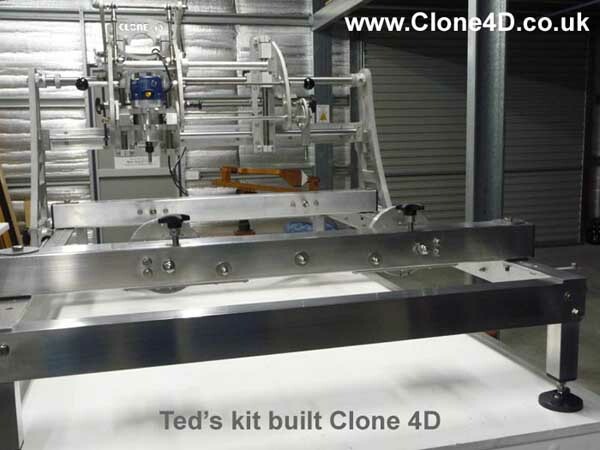 The Clone 4D pictured below was built by Ted from Australia using the Clone 4D kit. Ted learnt a lot of new skills whilst building his 4D and the results are a credit to his persistence, patience, and skill. Well done Ted! “I imagine you may be pleased, and perhaps even relieved, to know that my Clone 4d is built. Please see attached. I know you have seen many photos, and many in the flesh as it were, but I am particularly proud of mine! I have not done much beyond a bit of polishing here and there – I think it looks beautiful as it is. I want to thank you very much, for your brilliant invention, fantastically helpful manual, and your willingness to provide personalised advice when I needed it. I hope you continue to have great success with the Clone enterprise”.